Recently we were honored to receive a “When work works” award from whenworkworks.org. We are lucky enough to be among some of the leading companies in America today, capable of helping employees enjoy their time at work, and making the most of their careers. With our flexible schedules, employee incentives, and and all around great work culture, we are continually striving to be a great place to work. But this got us thinking, what exactly is it that makes work…well, work? It seems like no matter where you look, there is some new, young start up with Ping Pong tables in the office, or yoga every Monday morning. While those things are great incentive, and can often liven up the culture of the office, are they really why people love coming to work? After all, you can do Yoga at home, or get your own ping pong table. But what about the things that are a little less in your control? We believe those may be the things that employees are truly looking for in todays market. The world of business isn’t what it was 50-60 years ago. People aren’t looking to work 9-5 for the rest of their lives. The world is growing at an exponential rate, and more and more people are wanting to experience what it has to offer. They don’t want to spend all day every day in the office, in meetings or at their desk. Since the introduction of the internet, the business world has grown, and continues to grow more and more every day. It is now possible for us to work from places we never could have before, our schedules have become far more flexible than they were even 10 years ago. The possibility of working from home, and raising a family is becoming a cultural norm. More and more families are being raised with 2 working parents. We believe it is this that lies at the core of what employees are looking for in todays workplace. A recent study by fairygodboss.com shows that, after compensation, flexible hours beat out every other factor when deciding on a job. People want to be able to live their lives, they want to be able to be with their families, while also supporting them. Catered lunches, and video games in the office are great, but being able to be home with your family, while also working on your career is something you just cant put a price on. Dell, an industry leader, is aiming to have 50% of their global workforce on flexible schedules by 2020, says Steve Price, senior vice president of human resources. Encouraging more and more employees to work flexible schedules has saved Dell $21 million since 2013 in real estate costs alone. Now, we aren’t saying that employees should only ever work from home, but giving your employees the freedom to do so from time to time is an absolutely great way to make them feel trusted to do what they know is expected of them, a way to show them that you know they are competent, and capable of keeping themselves on task. Controlling your employees every move will only result in constant turn over, and a less productive work place, costing you money as a result. Give your employees the space to become the hard worker you know they are capable of becoming. “We’ve found that when employees are given flexibility, they are more highly engaged,” says Melanie Collins, global head of people partners. Dropbox is also making waves recently with their “No Meeting Wednesdays”. This helps to ensure that their employees have a full day to do what it is they need to do, with out the interruptions of meetings, one-on-ones, or things of that nature. They are allowed to bear down and focus on what needs to be done, with out being distracted. It’s always important to ask yourself “Can this meeting be condensed into an email or memo?” There is something very stressful about sitting in a meeting, all the while knowing that there is work piling up on your desk. Make sure you are giving your employees the time and tools to do what you are asking them to do. No one wants to spend 40 hours a week stressed to the breaking point, thinking about the work load they have been given. Thank you again to the amazing people at whenworkworks.org. We are very honored to be given this award, and we will continually strive to be worthy of it. What do you believe makes work work? 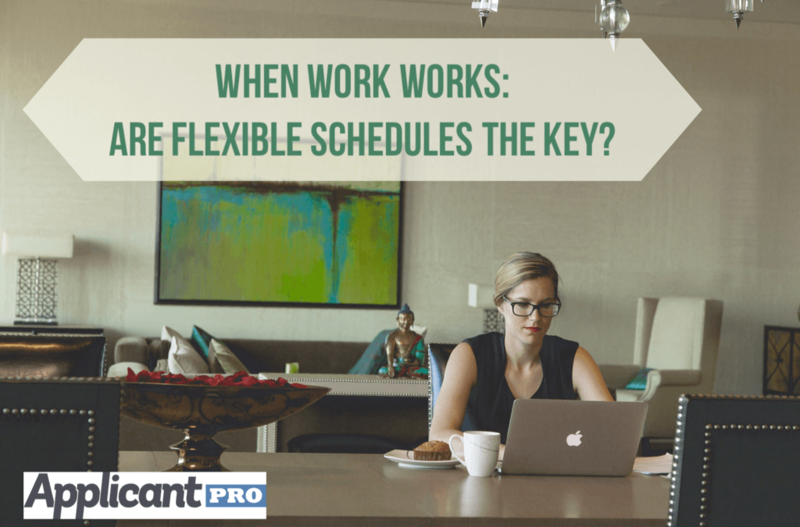 How do you feel about flexible schedules? We want to hear your feedback. Or, maybe you have a question for us. Feel free to contact us any time you need, we are happy to help with any and all questions.